An era was over and a new Europe was being born. This much was obvious. But with the passing of the old order many longstanding assumptions would be called into question. What had once seemed permanent and somehow inevitable would take on a more transient air. . . Europe’s future would look very different—and so would its past. . . Whatever shape Europe was to take in the years to come, the familiar, tidy story of what had gone before had changed forever. In the introduction to his magisterial Postwar: A History of Europe Since 1945, Judt was writing of Europe’s rise from the ashes of World War II as a continent of some 46 countries sought to overcome a long legacy of division and conflict. His book was published in 2005, and Judt himself died in 2010, but his words could have been written after the Brexit vote. Europe remains a very untidy story, unsettled and full of questions. When the European Union was hammering out its constitution a dozen years ago, there was considerable discussion about the status of Europe’s Christian heritage in a secular and pluralistic age. Of course, a return to a “Christendom” was neither possible nor desirable, but Scottish theologian David Jasper suggests that the noblest aims of the European Union could trace their roots to the (often neglected) Christian understanding of self-giving love rather than authoritarian power as the divine principle at the heart of reality. A political life governed by love rather than naked power, he argues, would be “voluntary, willed, and deliberate, a working through of our diversities in totally conscious acts of friendship pursued in love and charity with our neighbors.”[ii] It would build bridges instead of walls. It remains to be seen which kind of story will prevail, not only in Europe and the UK, but in the United States as well, where many “longstanding assumptions” about social harmony and progress have been cast into doubt by the disturbing resurgence of nativism, bigotry and racism. 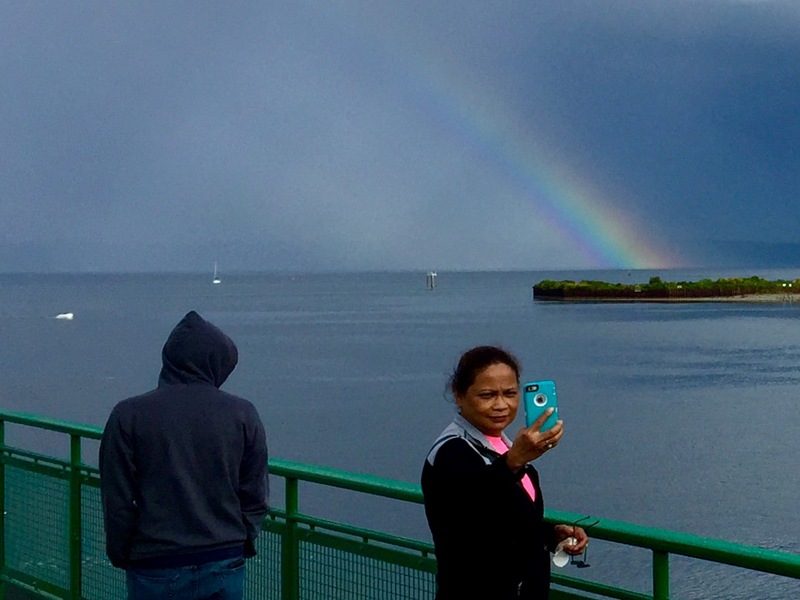 I took this photo on the Seattle-Bainbridge ferry on June 24. The Brexit vote had been announced the night before, on “Midsummer Night,” when, in olden times, mischievous spirits were said to be abroad, and bonfires were lit on British hilltops to aid the sun in its long decline toward winter. I am not qualified to judge how much mischief and decline can be attributed to the Brexit vote, but the uncertainties of which Judt had written were much on my mind when I happened to see this rainbow, a biblical sign of promise. I snapped the photo on the fly without really composing it, but then I began to see things in it.. The woman seems representative of America as a land of immigrants. She contemplates her own image, like Venus with her mirror. Who am I? How did I get here? She is framing herself against the rainbow. She herself is part of the American rainbow. Is she surprised by what her screen is showing her? Does she register delight at existing in a world of rainbows? Will she turn to see the rainbow itself and not its image only? We can’t see the face of the young man in the hoodie. He is a mysterious blank, the stranger from God knows where, a veiled presence destabilizing the scene with some unspoken question. His head is turned toward the rainbow, but his hands remain in his pockets. They are not extended in wonder or blessing. His thoughts and feelings are opaque to us. He is shut within the monastery of his dark clothing. Does he see promise in the sky? Is he sad, lonely, aloof, indifferent? Is he experiencing prayerful or poetic rapture? We could compose a multitude of narratives about these two voyagers, but the only thing we know for sure is that they sail together on the same ark, and though the horizon seems dark, the shadows are illumined with the biblical sign of promise. This boat’s bound for glory, even if rough seas lie ahead. Last night, at the Oregon Bach Festival, I heard the world premiere of A European Requiem, by Scottish composer James MacMillan. It is an astonishing work of complex sonorities, dramatic colors, and exquisite textures. Although it was composed before Brexit, its title and theme feel particularly resonant now. Do we live in a time of requiem or rebirth? I was particularly struck by the work’s sublimity, that unnerving blend of fear and wonder generated in the presence of transcendent, overpowering mysteries. MacMillan seemed to suggest that the passage into whatever lies beyond our old familiar life is not altogether smooth and blissful. Hammering percussion and dissonant brass were anything but “rest eternal.” First the soul must be buffeted and broken open as the abyss of nonbeing widening before it. Only then can it hear the consoling chorus welcoming it into paradise. But while MacMillan’s music allowed us to hear rapturous echoes from the “other side,” it did not take us across the divide. Instead, it concluded with the solemn sounds of the death bed. High, raspy strings whispered the last few breaths of mortal life. And after that, only the slow heartbeat of a bass drum, fading into silence. Had the Requiem’s heavenly elements been merely a beautiful illusion, destined to vanish with every mortal thing? Or can we put our trust in something beyond the processes of dissolution and ending? Whether we are considering the fate of the world or the fate of the soul, it’s the question on which all else depends. On a lighter note, you can find my new photo essay on the spirituality of summer here. 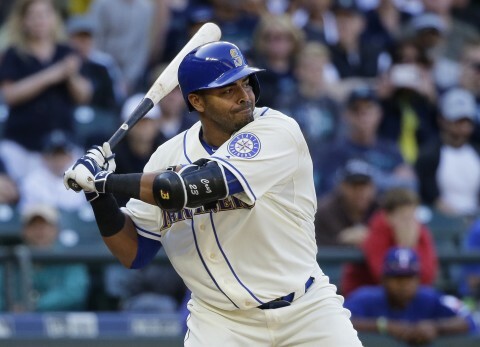 It was supposed to be the Mariners’ year in major league baseball. With a few weeks still left in the regular season, Seattle’s star pitcher has 17 wins, and their best batter has hit 40 home runs. These are great numbers. But the team itself has been out of the pennant race since July. For a long time, the Mariners just couldn’t score when they needed to, lost a lot of close games, and are currently 7 games out of first place, and 6 games below .500. With only 20 games left, their chances of making the playoffs are virtually nil. So has their season lost all its meaning? Was it all for nothing? If a season is worthwhile only if you win the championship, then only one team can ever stave off meaninglessness. But as basketball legend Bill Russell has noted, in sports “the basic unit of time is the moment. Sports fans and players appreciate each instant.”[i] We enjoy the evening highlights on ESPN even if we don’t follow a particular team, even if our own team is having a bad year, because we are witnessing the timeless essence of the sport: a great pitch, the crack of the bat, a stolen base, a diving catch. Sportswriter Meg Rowley, in an artful post called “How I learned to stop worrying and love Nelson Cruz,” reminds us that every game, every team, has moments of pure skill and beauty with a value unto themselves, regardless of their relevance to the overall standings. We watch the games even if they don’t “matter” in the long run, because we love those moments. I once saw Sandy Koufax strike out 18 Giants. I remember cheering and laughing with my dad from a bleacher seat high above right field. I remember Wally Moon blasting a 3-run homer to win the game in the bottom of the ninth. But I didn’t remember, until I looked it up, was the year it happened, or the fact that this dramatic win helped the Dodgers go on to win the World Series. Seasons come and go, fortunes rise and fall, but the special moments endure. As I savor the luscious local weather of late summer in Puget Sound, I am also conscious of its imminent departure. No matter how many perfect moments have adorned these summer months, no one gets a winning season in the game with time. The day will come when night falls early, the birds have gone, and it’s too cold to sit outside in the garden with a book. Emily Dickinson, who loved the “sacrament of summer days,” was haunted by the shadow of impermanence that falls across our sunlit lawns. The times when we forget that shadow, like the brief return of balmy weather in Indian summer, are but a “fraud that cannot cheat the Bee.”[iii] Yet Dickinson’s poetry, in its act of acute noticing, in its cherishing of the beauty which is all the more precious for its brevity, keeps the futility at bay. She could not solve the puzzle of where it was all headed, this ephemeral life. She wasn’t sure whether the future would turn out to be consummation or cessation (to borrow John Dewey’s evocative duality). Despite her inheritance of Christian vocabulary, she was steeped in nineteenth century doubt. But she always stepped to the plate and took her swings, and her readers still share the pleasure of her every at-bat. The dream of summer as a timeless sabbath from mortality soon vanished in the trenches, and with it many of Brittain’s generation, including her brother and her lover. But did the shortness of those young and precious lives invalidate whatever love and meaning and joy they did experience, however briefly? Like Emily Dickinson, Gustav Mahler confronted the shadow of impermanence in all of his work. He said specifically of his Second Symphony (“Resurrection”) that he was asking the big questions: “What did you live for? Why did you suffer? Is it all only a vast terrifying joke?”[v] With the vast orchestral intensity for which he was famous, Mahler takes the listener through a sonic storm of anguish and despair, hope and fear, apocalypse and catharsis, until the extraordinary moment when the chorus refutes the turmoil with the astonishing serenity, verging on silence, of its glorious invitation: Rise again. will carry you to God. In the emotionally charged silence which followed the Philharmonic’s inspired performance, no one dared clap or even whisper. Mehta kept his arms high and extended, seemingly frozen in his final gesture, for a very long thirty seconds, forbidding us to drown out “the note that is no more” with the harshness of applause. Norman’s eyes welled up. Some of the orchestra wiped away tears. It was the closest I’ve come to eternity. At last, very slowly, Mehta lowered his arms. When they finally reached his side, his shoulders relaxed, and we were all released back into time. We rose to our feet and thundered our joy. Yes, that sublime moment had kept futility at bay. More than that, it had carried us to God.